Maybe if you drink rosé in February, you can will spring to arrive? That was the theory Kristin Donnelly was operating under when she popped a bottle of pink wine and made these spicy clams. Maybe if you drink rosé in February, you can will spring here? That was the theory I was operating under when I popped a bottle of pink wine and made these spicy clams. Instead of sopping up the briny juices with pasta or bread, I opted for fiber- and protein-rich chickpeas. If you can’t find harissa, the Tunisian chile-and-spice paste, you can make it or use minced garlic and crushed red pepper in its place. 1. In a deep skillet, heat the olive oil. Add the onion and cook over moderately high heat, stirring, until softened, about 5 minutes. Add the harissa and cook, stirring, until fragrant, about 30 seconds. Add the chickpeas and cook, stirring, until heated through, about 2 minutes. Add the wine and boil for 1 minute. 2. Add the clams to the skillet, cover and cook, shaking the skillet occasionally, until the clams open, 5 to 8 minutes; discard any clams that do not open. 3. 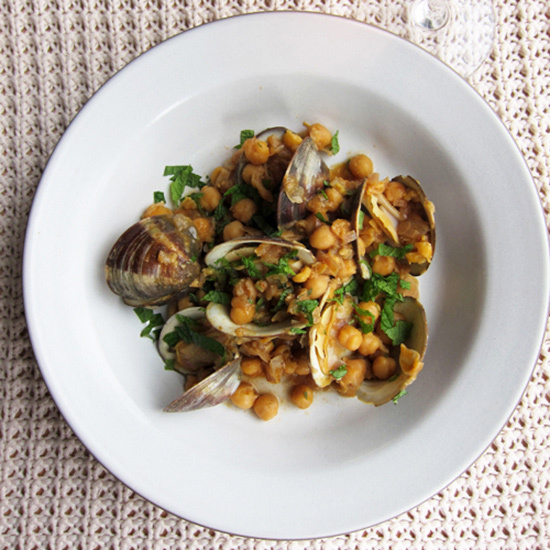 Spoon the clams and chickpeas into bowls, garnish with torn mint and serve immediately.